Visual Astronomy: Looks Like it Was an Impact! Looks Like it Was an Impact! Recently, I informed you about a "possible" Jupiter impact, similar to the Shoemaker-Levy 9 impact of 1994. Sure enough, NASA has captured this infrared image (at right) of the impact zone, showing that it most likely is an impact! This impact was discovered by Anthony Wesley of Australia, an amateur astronomer, using a 14.5" f/5 Newtonian reflector. Reports are flooding in from amateur and professional astronomers from around the world, so there's no shortage of confirmation of the event! 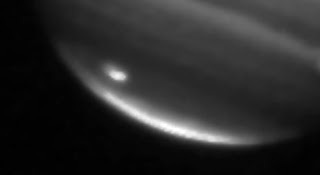 The dark spot left by the impactor can be seen at a latitude of about 60 degrees South in Jupiter's south polar region. With decent seeing, most backyard telescopes should be able to see the dark spot. To see the dark spot, visit the Lackawanna Astronomical Society's page showing when to view the dark spot! I wish I could observe this event, but we're under a low pressure system right now and won't be cloud free until it's gone! So if you've got any observations, post a comment! Sorry for being so late to the party, but have they determined whether this impact was a S-L trailing portion, or an unrelated impactor? I haven't heard anything new on it, but then again, I've been out of the loop a bit, while getting ready for grad school..